The Senate some weeks ago. Tuesday (April 14) it has scheduled the third reading of SB 941. UPDATE: As expected the Senate passed SB 941 on Tuesday, 17-13, with only Democrat Betsy Johnson joining the 12 Republicans in opposition to the bill. 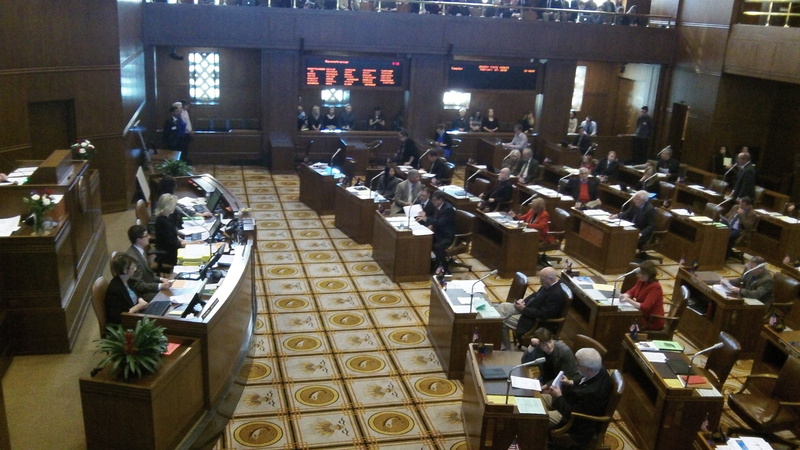 Democrats in the Oregon Senate on Tuesday expect to pass SB 941, the bill expanding Oregon’s background checks to people who seek to buy firearms from private gun owners. I wish its supporters could point to a single provable fact to make this bill worthy of becoming law. Instead, as I’ve said, the bill has a certain logic. We are requiring gun buyers at stores and gun shows to pass a background check by the FBI, so why not other legal buyers too? The trouble is that logic alone is not enough. Nobody, for example, has inquired whether the existing background checking is doing any good, which ought to be the main question. Some 99 percent or more of gun buyers clear the background checks because they are not criminals or known mental-health cases. Many of the rest are denied by mistake. So basically, almost everybody who goes through the system is not barred from owning a firearm. We have strict laws that felons must not own a gun, and the law imposes extra punishment for committing crimes with guns. And yet we know that countless people are arrested for being felons and owning guns, and the impression is strong that every criminal who wants a gun either has one or can get one. So the basic question is: What good is the background check system doing? And if it’s not doing much except create a lot of work, why make it cover even more legal sales? The Brady campaign for gun control testified that people can find firearms advertised on the Internet. It cited one example: In March somebody offered a Ruger 10/22 plus ammo in the Bend area on an online site and added “No background check” to his ad. So what? A 10/22 is good for plinking and maybe pest control, but there’s no reason to worry that a felon will want to buy it to commit more felonies. Supporters of this bill may sincerely believe it will reduce crime, but what about a fact or two? When the federal background check system took effect in 1998, did it accelerate the general decline in crime that’s been going on for decades now? Did gun ownershop among Oregon criminals decline, or did gun crime go down, when Oregon voters expanded the background check system to gun shows in 2000? And what about the bit about keeping guns out of the hands of the mentally unstable? Do Oregon mental health practitioners routinely report the names and Social Security numbers of their unstable patients to the FBI or the state police? If so, this might be an unwelcome surprise to their patients. If not, how does a background check apply to them? If “destroying this city, state, and country” means ensuring areas of blight are corrected and that immediately needed essential services facilities are constructed then I say destroy away! However, if destroying this city, state, and country means total obstructionism no matter what just so a few select individuals (a minority of Albany’s population) get their libertarian way then I stand completely in the way of such a mentality. Fearing/disliking guns is a visceral feeling not subject to logic. Those who do so therefore believe they should do everything they can to discourage gun ownership. They do not care about your Constitutional rights or your personal situation. They are only interested in trying to eliminate guns. It is not a rational position but a real one. Like many other Progressive /Democrat concepts it is based on what they feel, not on results or knowledge. It is therefore not subject to same. It does cause one to consider moving to a state with a more reality-based voter base. And what about those who do not “fear” guns – like gun owners who completely support background checks for ALL gun sales and transfers? This isn’t a “fear” issue but instead an issue of rationality. I do not support any agenda that would get rid of all guns – most individuals in America agree with this sentiment. What most Americans also agree on is that universal background checks should be the norm – this is a hard-cold fact Warren! That you buy into the propaganda that those who desire universal background checks want to take all guns away from all Americans only demonstrates that you have bought into a proven false argument. Kind of like the “brother-in-law” argument that is out there – an argument that completely ignores all other private (including interstate internet) sales to anybody regardless of their criminal background or demonstrated mental instability. To me the answer is clearly “yes”. If the issue is the penalty vs the crime, then what is fair? The Legislature chose “misdemeanor” followed by “felony”. I guess it could have been “infraction” followed by “misdemeanor” but the legislature must have felt that is not enough. Think about the potential effects: A violator could be complicit with a range from “nothing happens” to ” a dirt bag kills someone”. And they ARE complicit if they did not take a reasonable action under the law to stop a “dirt bag” from possessing a weapon. Someone must choose, and it falls to the legislature. If gun laws were the answer, Chicago would be the safest city in America. It is not. From this statement the question that begs to be asked is how do convicted felons and those deemed mentally incompetent acquire guns so easily? A major conduit for such acquisition is private gun sales, including anonymous internet sales made by those who are NOT licensed gun dealers to whoever wants to make a gun purchase. The NRA once supported universal background checks – but they shifted position with the hollow argument of; “The system doesn’t work. The FBI’s National Instant Check System (NICS) is not working now. We have to get that working before we can add any more checks to that system.” Of course, a huge part of why the NICS wasn’t working was because felons and those deemed mentally incompetent are able to acquire weapons at will – acquisitions made through the “gun show” loophole in the NICS! And that loophole, by the way, doesn’t only apply to gun shows but instead to ALL PRIVATE SALES! And then there is the “brother-in-law argument put forth by the NRA – an argument that completely ignores all other private gun sales and transfers, including internet sales, to any other person regardless of criminal background or demonstrated lack of mental instability. Legal sales are not, and never have been the problem, Gary. Never will be either. The only way your utopian dream will ever come true will be when every last gun in America meets the smelter. NOT going to happen. The answer is to make the penalty for committing a crime with a gun, OR being a felon in possession of a firearm SO SEVERE that only a mentally deranged person would even consider it. Five years in prison minimum. TEN would be better, and I would have no problem paying the taxes to incarcerate those kind of people. That’s the kind of “gun control” I can get behind. When the liberal crowd gets behind STRICT ENFORCEMENT of current laws with penalties that give judges no wiggle room, only then will I consider any further restrictions for law abiding people to own guns. We will never keep guns from the hand of criminals. Haven’t you figured that out yet? Your continued blather about the “popularity” of universal background checks equates to mob rule…and ignores the wisdom and founder’s intent in providing us with the 2nd Amendment, which is the “people’s teeth” in the Constitution. But in fact “legal sales” are the problem, some of them anyway. This is because it is “legal” for any private citizen to sell a gun to any other private citizen. The thing is that some of those private citizens those guns being sold to, by other private citizens, are banned from purchasing them from ONLY a licensed dealer today. So those with felony convictions or deemed mentally incompetent to own a gun can easily sidestep the law through this “gun show” loophole. Seriously – what part of this DON’T you understand? Universal background checks (UBC’s) eliminates this loophole. UBC’s don’t “punish” anybody but those legally deemed unable to own a gun. This in no way is a “utopian dream that will cause every gun in America to be tossed into a smelter.” That comment of yours, however, is nothing more that the fear tactic used by the NRA that you have bought into. As I stated – I as most Americans would not support nor tolerate any measure that would even look in this direction. The level of severity you think would stop all but the mentally deranged is absurd at best. First off, do you honestly think the creation of such legislation would stop the criminal element – nobody else does. Secondly, such legislation would most likely worsen the situation overall. This since one who uses a gun to commit a crime under such laws will know that if witnesses remain behind that they will face a sentence they might find so unreasonable. With that in mind they very well might instead simply kill their victim as a viable option of “protecting” themselves from a long prison term. Take a look at the no wiggle room the “three strikes and you are out” law, and tell me how well that has worked out for America. It is costing us billions every year to incarcerate the offenders, many sent up for long sentences on pretty minor and/or trumped up charges. Our prisons are full of mostly inner-city youth that mostly have no options upon release but to turn to more crime – yea, that plan worked out real well. UBC’s do NOT impede upon the right of law abiding citizens to purchase and own guns – PERIOD! The only “blather” going on here is when you say that more than 90% of American’s who support UBC’s is “mob rule.” Ah, but want can one expect from any good Libertarian except a “rule by minority” mentality! Do you think guns is the only way to get government to fear the people – really? What about instituting term limits that prevent politicians from creating personal political dynasties and life-long positions that they protect at the expense of their electorate? What about voting out politicians that act in opposition to the will of the people. Do you honestly think that any American population today would be able to withstand the military machine that big business has created and will defend with their, and our, last breaths? Get big business money out of politics and our judicial branches of government, make term-limits MANDATORY for all politicians at the state level or above – this is the BEST way to fight our government today! Quote Jefferson all you want, but a perspective from a man that had absolutely ZERO concept of what weaponry, America’s military machine, and corporate ownership of America would develop into is so dated it is all but irrelevant. Okay! You happy now? You wrote more than I did. By the way….Thomas Jefferson was a far wiser man than you. I don’t view this as a contest of how many words one writes but instead the content therein. In my last post I clearly demonstrated that your argument is fatally flawed, and your response was to say “T. Jefferson was a far wiser man that I.” Although your statement might very well be true it fails to further our discussion. Do you still stand behind your statement of:”Legal sales are not, and never have been the problem, Gary. Never will be either.” If so, and after what I presented to you ,then why? After all, it is through a legal loophole that felons can legally purchase guns from a private seller because there is no statutory mandate that requires background checks on private sales. And the only reason my response was as long as it was is because I wanted to ensure I didn’t skip any part of what you said. Gary, You quoted me in your post as follows: “utopian dream that will cause every gun in America to be tossed into a smelter.” Nothing close to what I said. Outright lie. Next time you purport to quote me, use copy and paste. It’s far more accurate than your interpretations. Can you say PARAPHRASE – quit splitting hairs as a means to change the subject or falsely justify a nonexistent position you hold.